“The source of inspiration for these new decanters were beautifully crafted cognac and whisky bottles – some up to 100 years old – that I discovered on a visit to one of London’s most fashionable “fine wine stores”. I reinterpreted these impressions for the design of my Margaux, Macon and Marne wine decanters, in which form and function come together in a perfect symbiosis”. The decanters, handmade in crystal glass and named after wine regions, have a modern yet classic design. Maximilian RIEDEL asserts that they are in keeping with the modern trend towards minimalism: “Back to basics. 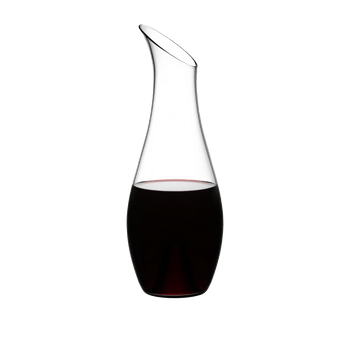 Although RIEDEL decanters with a double-or triple-decanting function are extremely practical, some people find them too complicated and intricate to handle. With these three new decanters, we are taking a step back and offering an alternative that we think reflects today’s zeitgeist perfectly“. RIEDEL tip: use bottle cleaners to remove stains inside the decanter. "